This written guide will help beginners and novices to obtain effective results when soldering electronic components. If you have little or no experience of using a soldering iron, then we recommend that you practice your soldering technique on some fresh surplus components and clean stripboard (protoboard), before experimenting with a proper constructional project. This will help you to avoid the risk of disappointment when you start to assemble your first prototypes. If you’ve never soldered before, then read on! Topics in this section include: Voltage, Wattage, Temperature Control, Soldering Stations, Anti-Static Protection, Bits (Tips), Spare Parts, and Gas-Powered Irons. The most fundamental skill needed to assemble any electronic project is that of soldering. It takes some practice to make the perfect joint, but, like riding a bicycle, once learned is never forgotten! The idea is simple: to join electrical parts together to form an electrical connection, using a molten mixture of lead and tin (solder) with a soldering iron. A large range of soldering irons is available – which one is suitable for you depends on your budget and how serious your interest in electronics is. Voltage: Most irons run from the mains at 240V (110V in the US). However, low voltage types (e.g. 12V or 24V) generally form part of a “soldering station,” and are designed to be used with a special controller made by the same manufacturer. Wattage: Typically, soldering irons may have a power rating of between 15-25 watts or so, which is fine for most work. A higher wattage does not mean that the iron runs hotter – it simply means that there is more power in reserve for coping with larger joints. This also depends partly on the design of the “bit” (the tip of the iron). Consider a higher wattage iron simply as being more “unstoppable” when it comes to heavier-duty work, because it won’t cool down so quickly. A proper temperature-controlled iron will be quite a lot more expensive – retailing at say 40 UKP (60 USD) or more. This type of iron will have some form of built-in thermostatic control, to ensure that the temperature of the bit (the tip of the iron) is maintained at a fixed level (within limits). This is desirable, especially during more frequent use, since it helps to ensure that the temperature does not “overshoot” in between times, and also guarantees that the output will be relatively stable. Some irons have a bimetallic strip thermostat built into the handle which gives an audible “click” in use: other types use all-electronic controllers, and some may be adjustable using a screwdriver. be sold separately, so you can pick the type you prefer). 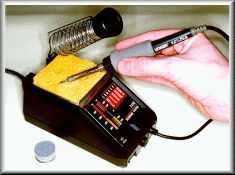 Soldering stations consist of a complete bench-top control unit into which a special low-voltage soldering iron is plugged. Some versions might have a built-in digital temperature readout, and will have a control knob to enable you to vary the setting. The temperature could be boosted for soldering larger joints, for example, or for using higher melting-point solders (e.g. silver solder). These are designed for the most discerning users, or for continuous production line and professional use. The best stations have irons which are well balanced, with comfort-grip handles which remain cool all day. A thermocouple will be built into the tip or shaft, which monitors temperature. materials in their construction to ensure that static does not build up on the iron itself. You may see these listed as “ESD safe” (electrostatic discharge proof). The cheapest irons won’t necessarily be ESD-safe but never the less will still probably perform perfectly well in most hobby or educational applications if you take the usual anti-static precautions when handling the components. The tip would need to be well earthed (grounded) in these circumstances. Bits: It’s useful to have a small selection of manufacturer’s bits (soldering iron tips) available with different diameters or shapes, which can be changed depending on the type of work in hand. You’ll probably find that you become accustomed to, and work best with, a particular shape of tip. Often, tips are iron-coated to preserve their life, or they may be bright-plated instead. Copper tips are seldom seen these days. Spare Parts: it’s nice to know that spare parts may be available, so if the element blows, you don’t need to replace the entire iron. This is especially so with expensive irons. Check through some of the larger mail-order catalogues. Gas-Powered Irons: You will occasionally see gas-powered soldering irons which use butane rather than the mains electrical supply to operate. They have a catalytic element which, once warmed up, continues to glow hot when gas passes over them. Service engineers use them for working on repairs where there may be no power available, or where a joint is tricky to reach with a normal iron, so they are really for occasional “on the spot” use for quick repairs, rather than for mainstream construction or assembly work. And Finally: A solder gun is a pistol-shaped iron, typically running at 100W or more, and is completely unsuitable for soldering modern electronic components: they’re too hot, heavy and unwieldy for micro-electronics use. Plumbing, maybe..! Topics in this section include: Quick Summary Guide, Cleanliness of Components, Temperature, Time, and Amount. Quick Summary Guide: Turning to the actual techniques of soldering, firstly it’s best to secure the work somehow so that it doesn’t move during soldering and affect your accuracy. In the case of a printed circuit board, various holding frames are fairly popular especially with densely populated boards. The idea with a holding frame is to insert all the parts on one side (this may be referred to as “stuffing” or “populating” the board), hold them in place with a special foam pad to prevent them from falling out, turn the board over, and then snip off the wires with cutters before making the joints. The frame saves an awful lot of turning the board over and back again, especially with large boards. Other parts could be held firm in a modeller’s small vice, for example. Solder joints may need to possess some degree of mechanical strength in some cases, especially with wires soldered to, say, potentiometer or switch tags, and this means that the wire should be looped through the tag and secured before solder is applied. The down side is that it is more difficult to desolder the joint (see later) and remove the wire afterwards, if required. Otherwise, in the case of an ordinary circuit board, components’ wires are bent to fit through the board, inserted flush against the board’s surface, splayed outwards a little so that the part grips the board, and then soldered. semiconductors, I often tend to leave the snipping until after the joint has been made, since the excess wire will help to sink away some of the heat from the semiconductor junction. Integrated circuits can either be soldered directly into place if you are confident enough, or better, use a dual-in-line socket to prevent heat damage. The chip can then be swapped out if needed. Parts which become hot in operation (e.g. some resistors), are raised above the board slightly to allow air to circulate. Some components, especially large electrolytic capacitors, may require a mounting clip to be screwed down to the board first, otherwise the part may eventually break off due to vibration. A little effort spent now in soldering the perfect joint may save you – or somebody else – a considerable amount of time in troubleshooting a defective joint in the future. The basic principles are as follows. Really Clean: Firstly, and without exception, all parts – including the iron tip itself – must be clean and free from contamination. Solder just will not “take” to dirty parts! 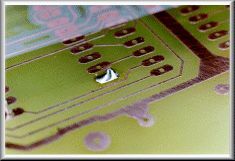 Old components or copper board can be notoriously difficult to solder, because of the layer of oxidation which builds up on the surface of the leads. This repels the molten solder and this will soon be evident because the solder will “bead” into globules, going everywhere except where you need it. Dirt is the enemy of a good quality soldered joint! Hence, it is an absolute necessity to ensure that parts are free from grease, oxidation and other contamination. In the case of old resistors or capacitors, for example, where the leads have started to oxidise, use a small hand-held file or perhaps scrape a knife blade or rub a fine emery cloth over them to reveal fresh metal underneath. 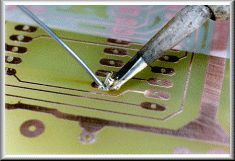 Stripboard and copper printed circuit board will generally oxidise after a few months, especially if it has been fingerprinted, and the copper strips can be cleaned using an abrasive rubber block, like an aggressive eraser, to reveal fresh shiny copper underneath. Also available is a fibre-glass filament brush, which is used propelling-pencil-like to remove any surface contamination. These tend to produce tiny particles which are highly irritating to skin, so avoid accidental contact with any debris. Afterwards, a wipe with a rag soaked in cleaning solvent will remove most grease marks and fingerprints. After preparing the surfaces, avoid touching the parts afterwards if at all possible. Another side effect of having dirty surfaces is the tendency for people to want to apply more heat in an attempt to “force the solder to take.” This will often do more harm than good because it may not be possible to burn off any contaminants anyway, and the component may be overheated. In the case of semiconductors, temperature is quite critical and they may be harmed by applying such excessive heat. tins the iron ready for use. An equivalent is Adcola Tip-Save. heating, and is seen as a brown fluid bubbling away on the joint. Acid fluxes (e.g. as used by plumbers) must never be applied. 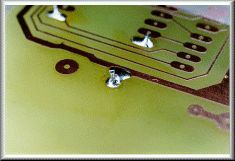 Other solders are available for specialist work, including aluminium and silver-solder. Different solder diameters are produced, too; 20-22 SWG (19-21 AWG) is 0.91-0.71mm diameter and is fine for most work. Choose 18 SWG (16 AWG) for larger joints requiring more solder. Temperature: Another step to successful soldering is to ensure that the temperature of all the parts is raised to roughly the same level before applying solder. Imagine, for instance, trying to solder a resistor into place on a printed circuit board: it’s far better to heat both the copper PCB and the resistor lead at the same time before applying solder, so that the solder will flow much more readily over the joint. Heating one part but not the other is far less satisfactory joint, so strive to ensure that the iron is in contact with all the components first, before touching the solder to it. The melting point of most solder is in the region of 188°C (370°F) and the iron tip temperature is typically 330°C to 350°C (626°F to 662°F). from over-heating. Beginners find them reassuring until they’ve gained more experience. 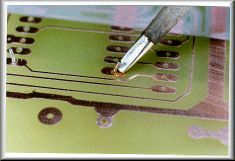 Solder Coverage: The final key to a successful solder joint is to apply an appropriate amount of solder. Too much solder is an unnecessary waste and may cause short circuits with adjacent joints. Too little and it may not support the component properly, or may not fully form a working joint. How much to apply, only really comes with practice. A few millimetres only, is enough for an “average” PCB joint, (if there is such a thing). A soldered joint which is improperly made will be electrically “noisy,” unreliable, and is likely to get worse over time. It may even not have made any electrical connection at all, or could work initially and then cause the equipment to fail at a later date! It can be hard to judge the quality of a solder joint purely by appearances, because you cannot say how the joint actually formed on the inside, but by following the guidelines there is no reason why you should not obtain perfect results. A joint which is poorly formed is often called a “dry joint.” Such a joint usually results from dirt or grease preventing the solder from melting onto the parts properly, and is often noticeable because of the tendency of the solder not to “spread,” but to form beads or globules instead, perhaps partially. Alternatively, if it seems to take an inordinately long time for the solder to spread, this is another sign of possible dirt and that the joint may potentially be a dry one. There will undoubtedly come a time when you need to remove the solder from a joint: possibly to replace a faulty component or fix a dry joint. The usual way is to use a desoldering pump which works like a small spring-loaded bicycle pump, only in reverse! (More demanding users using CMOS devices might need a pump which is ESD safe.) A spring-loaded plunger is released at the push of a button and the molten solder is then drawn up into the pump. It may take one or two attempts to clean up a joint this way, but a small desoldering pump is an invaluable tool especially for PCB work. Sometimes, it’s effective to actually add more solder and then desolder the whole lot with a pump, if the solder is particularly awkward to remove. Care is needed, though, to ensure that the boards and parts are not damaged by excessive heat; the pumps themselves have a P.T.F.E. nozzle which is heat proof but may need replacing occasionally. An excellent alternative to a pump is to use desoldering braid, including the famous American “Soder-Wick” (sic) or Adcola “TISA-Wick” which are packaged in small dispenser reels. This product is a specially treated fine copper braid which draws molten solder up into the braid where it solidifies. The best way is to use the tip of the hot iron to press a short length of braid down onto the joint to be desoldered. The iron will subsequently melt the solder, which will be drawn up into the braid. 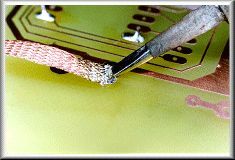 Take extreme care to ensure that you don’t allow the solder to cool with the braid adhering to the work, or you run the risk of damaging PCB copper tracks when you attempt to pull the braid off the joint. I recommend buying a small reel of de-soldering braid, especially for larger or difficult joints which would take several attempts with a pump. It is surprisingly effective, especially on difficult joints where a desoldering pump may prove a struggle. “Tin” the iron tip with a small amount of solder. Do this immediately, with new tips being used for the first time. 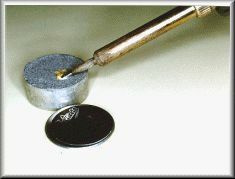 Clean the tip of the hot soldering iron on a damp sponge (many people then add a tiny amount of fresh solder to the cleansed tip). Continue heating, then apply sufficient solder only, to form an adequate joint. The solder won’t “take”: If grease or dirt are present, desolder and clean up the parts. Or, the material may simply not be suitable for soldering with lead/tin solder. The joint is crystalline or grainy-looking: The parts forming the joint may have been moved before being allowed to cool, or the joint was not heated adequately (too small an iron or too large a joint). The solder joint forms a “spike”: The joint was probably overheated, burning away the flux. Immediately cool the affected area with cold running water, ice, or even frozen peas, for ten minutes. Remove any rings etc. before swelling starts. Do not apply lotions, ointments etc., nor prick any blisters which form later. Seek professional medical advice where necessary. lifespan. Poor soldering can be an expensive business - causing product failure and downtime, engineer’s maintenance time and customer dissatisfaction. At hobbyist level, bad soldering technique can be a cause of major disappointment which damages your confidence. It needn’t be like that: soldering is really easy to learn, and like learning to ride a bike, once mastered is never forgotten! 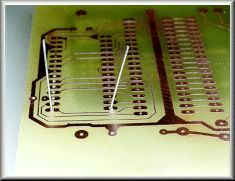 These ten photos illustrate the basic steps in making a perfect solder joint on a PCB. If you’re a beginner, our advice is that it’s best to practice your soldering technique using some clean, new parts with perhaps some new stripboard (protoboard). Be sure to avoid using old, dirty parts; these can be difficult if not impossible to solder. Boards must be clean to begin with, especially if they’re not previously “tinned” with solder. Clean the copper tracks using e.g. 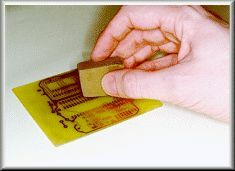 an abrasive rubber block. Clean the iron “bit” (tip) using a damp sponge. The iron featured here is an Ungar Concept 2100 Soldering Station. A useful product is Multicore’s Tip Tinner Cleaner (TTC) - a 15 gramme tin of special paste which cleans and “tins” the iron, in one go. Insert the components and splay the leads so that the part is held in place. It’s usually best to snip the wires to length prior to soldering. This helps prevent transmitting mechanical shocks to the copper foil. 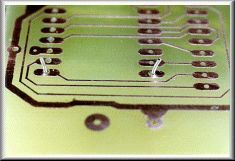 An example of a “dry” joint - the solder failed to flow, and instead beaded to form globules around the wire. “Solder Wick” is a cheap and very effective way of desoldering a joint. Take care not to overheat the board. Alternatively, use a desoldering pump. (http://www.epemag.wimborne.co.uk) and reproduced by permission. The Basic Soldering Guide photographs are © 1999 Copyright Alan Winstanley (alan@epemag.demon.co.uk) and reproduced by permission. You are welcome to download it, print it and distribute it for personal or educational use. It may not be used in any commercial publication, mirrored on any commercial site, nor may it be appended to or amended, or used or distributed for any commercial reason, without the prior permission of the Publishers. accepted for any errors herein. The British mains voltage supply is 230V a.c. – you should amend ratings for local conditions.